Doctoral studies pursued from P.G.I.M.E.R, Chandigarh, in 1998, in the speciality of cardiology. Experienced in handling complex coronary interventions like bifurcation lesions, chronic total occlusions, ostial lesions, left main lesions and primary angioplasty. Expertise in all contemporary interventional devices like rot ablation distal protection devices, IVUC, OCT etc. Trained in performing wide range of non-coronary interventions like carotid, renal and peripheral angioplasties, pacemakers ,device closures of septal defects, endovascular repair of aortic aneurysms etc. He is one of the pioneers in introducing and popularizing transradial coronary procedures in India. He performed over 20,000 coronary procedures including over 15,000 transradial coronary procedures. He was vast experience in performing complex coronary interventions like bifurcation lesions, chronic total occlusions, ostial lesions, left main lesions and primary angioplasty. He has expertise in the use of all contemporary interventional devices like rotablation distal protection devices, IVUC, OCT etc. 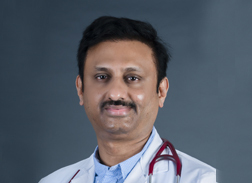 He is experienced in performing wide range of non-coronary interventions like carotid, renal and peripheral angioplasties, pacemakers, device closure of septal defects, endovascular repair of aortic aneurysms etc.